Thriller author K.V. 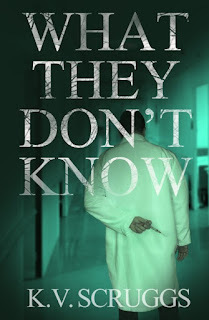 Scruggs joins me today to talk about her new medical thriller, What They Don’t Know. She is an alumna of Clemson University and received her MD from the Medical University of South Carolina in Charleston. She completed her residency in Internal Medicine at the University of North Carolina – Chapel Hill. She is currently working as a hospitalist and lives in Raleigh, North Carolina with her husband, two sons, and ornery cat, Jules. In her fiction writing, Dr. Scruggs not only draws from her experience as a physician, but as a wife, friend and mother. What They Don’t Know is her first novel. Welcome, K.V. Please tell us about your current release. What They Don’t Know is part thriller, part cautionary tale. It’s about what could happen if control over healthcare decisions gets put in the wrong hands, if people who are strictly financially motivated start calling the shots. In some ways this has already happened, so it doesn’t take too much imagination to picture it playing out that way. The story just takes it to another, terrifying level. I work as a physician in the hospital. Oftentimes, I think of crazy “what-if” scenarios, and some of them develop into an entire story line. The crazier, yet most believable, the better. I mostly write for entertainment, but I also really care about the direction healthcare is going, and I think that comes across in my writing. I have seen themes come out in my fiction writing that I didn’t necessarily intend to write about but certainly agree with. For example, electronic healthcare records are not the end-all be-all of providing exceptional, efficient medical care. You still need a conscientious and qualified professional on the other side of the computer. Another main theme of the novel is that there’s no such thing as a free lunch. When you read the book you’ll understand what I mean by that! You can read an excerpt from What They Don’t Know here. I have some ideas about a sequel to What They Don’t Know, and I’ve started plotting out the storyline. I am also working on a psychological/domestic thriller. It’s a story about a preteen boy whose younger sister is murdered in Smalltown, USA. I always loved reading and writing growing up, but during medical school and residency I wasn’t able to do much in the way of hobbies. Once I was established in my career, I started writing. I just sat down to write one day and my journal entry became a short story, which ultimately became a novel. That was in 2011. I started What They Don’t Know, my second full-length (but first published) novel in 2014 when my oldest son was one. No, I also work as a hospitalist physician (an Internal Medicine doctor that takes care of people admitted to the hospital). When I’m actively writing or editing, I try to commit to 1000 words (or a certain number of pages, if editing) a day. If I don’t get to it in the morning or throughout the day, then I know it has to get done before my head hits the pillow. For someone who loves to relax before bed, it’s a great motivator! There are some days it just doesn’t get done, but I am usually happy with 5 or 6 days a week, especially since it usually averages 7000+ words a week. Well, I sit in the same spot on my couch to write pretty much all the time. It’s hard to think creatively if I’m not in that one spot. I have several spots around my house designed to be perfect writing havens, but I always seem to go back to the couch. I would also say I get my best writing done when the pressure’s off. Sometimes sitting down at the beginning of the 1000 words is super intimidating, but once I’ve hit 1000, or at least hit my stride, it’s much easier to continue. Probably for that reason, I also find it easier to pick up where I’ve left off if I stop writing mid-scene. The next day, the writing just flows naturally since I already know what’s going to happen next. A scuba diver. And a writer, that was definitely a dream of mine. It has been a dream come true to publish this novel and have people read it. Truly, it is such a privilege. So I just want to thank everyone out there for reading and continuing to support the writing community. Thanks for being here today, K.V.